Are you a student of grade 5? Does working with a long chain of decimals scare you? Then learn this essential skill of rounding decimals. 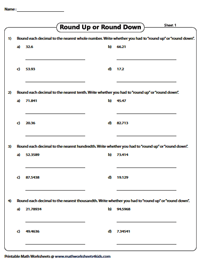 Incorporated here are rounding decimals worksheets that contain exercises to round off decimals on a number line, rounding up or down, rounding decimals to the nearest whole number, tenths, hundredths or thousandths, word problems and more. The best possible way to learn rounding decimals is to use the number line tool. 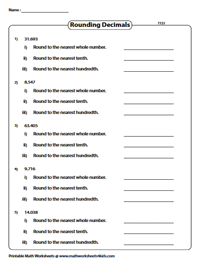 Included here are worksheets with number lines to practice rounding decimals to the nearest whole number, tenths or hundredths. 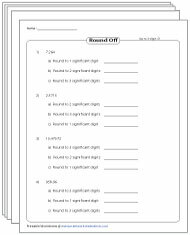 Implement these worksheets to round up or round down the decimals to the nearest whole number, tenths, hundredths and thousandths. 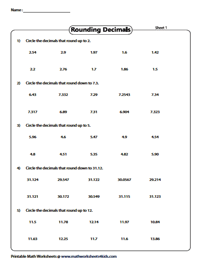 Spot the decimals that round up or down to the specified whole number or decimal place values and circle them. Round each decimal to the nearest whole number. Make calculations simple by rounding up if the value is greater than or equal to 5 and round down if it is less than 5. Observe the digit in the hundredths place to round the decimal to the nearest tenth in these decimal rounding worksheets. 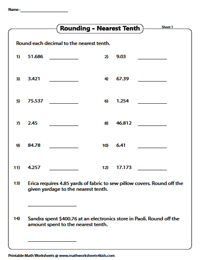 Apply the concept of rounding decimals to real-life word problems. 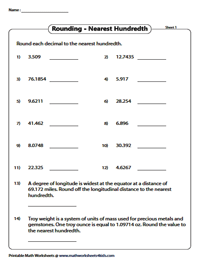 Analyze the thousandths place value to round the decimals to the nearest hundredth. Two word problems are featured in each worksheet. Recognize the digit in the ten thousandths place and round it to the nearest thousandth. 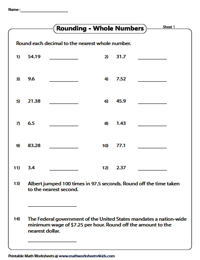 Reiterate the concept of rounding decimals with these worksheets consisting of drills and word problems. This worksheet serves best in testing the logical skills of children. Observe the series of digits given and build decimals that can be rounded off to the specified whole number. 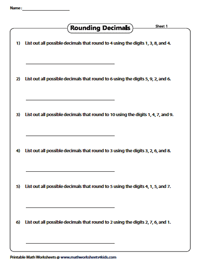 Round each decimal to the nearest whole number, tenths and hundredths in these revision worksheets that are presented in two different formats. 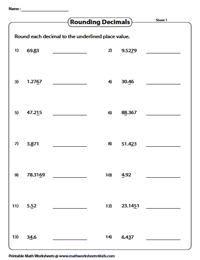 Review the concept of rounding decimals in this set of worksheets. Examine the underlined digit, identify its place value and then round off the decimals to the required place value. 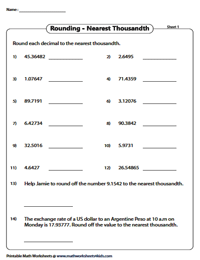 A fun way to recapitulate rounding decimals is featured here. 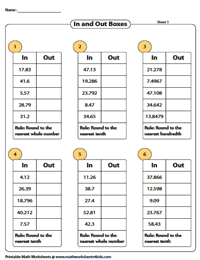 Every in and out box comes with a rule, apply the rule to round off each decimal in the box to the specified place value. 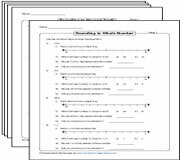 Grab this assortment of rounding significant figures worksheets to heighten your understanding with skills like rounding to one, two and three significant figures, rounding up to five significant figures, rounding significant figures involving arithmetic operations and more.